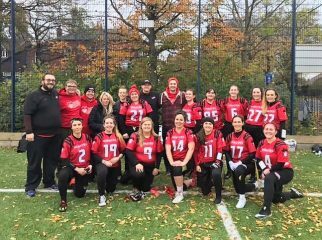 After a huge week two performance, the East Kilbride Pirates women’s flag team travelled to Manchester to take on some familiar foes. The Manchester Titans women’s program was on a brief hiatus from the Opal Series, but had returned this year with strong results. A big effort was going to be required to take down the host side. Meanwhile, fixtures against the Hallam Rangers and play-off bound Hallam Warriors would be stiff tests as the Pirates looked to remain perfect. In their first game, the Pirates got a warmup against the Sheffield Hallam Rangers. The offence continued their fine form with Clare Dynes and Louise Donnelly picking up two scores each through the air, with Louise adding another on the ground. The defence got in on the scoring action with three interceptions returned for scores, as they picked off the Rangers QB six times in a dominant display. Strong tackling from Robyn McCluskey and Katy Meina (6 tackles each) kept the Rangers in long field situations, which led to the high number of turnovers. The Pirates ran out 68-0 victors, and turned their sights to the Hallam Warriors. The Hallam Warriors proved their worth with a strong first half display, keeping the Pirates offence in check for the most part. Thankfully, the defence kept another clean sheet, as they restricted the Warriors’ deep passing game with excellent coverage. 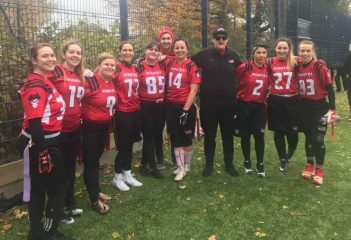 Kerry McLaughlin and Carla Costa picked up an interception each, while Rebecca Gibson totalled two sacks in a shutdown display. The offence got things going again, and Clare Dynes added another 3 TDs to her total. The Pirates won 31-0 against one of the top sides from the Opal Series North. In their final game of the day, the Pirates defence would allow its first points, as the Titans picked up an opening-drive score. The offence was on fire by this point, as deep passes to Paige Cawley led to three scores from the receiver. Aynlsley Barclay finished with 7 TDs in an excellent showing, while Michelle Holburn-White, filling in for the injured Clare Dynes, snagged herself a TD and two XPs. On defence, the unit continued to click, with debuting Becky Miller batting down a number of passes. Carla Costa had a thrilling interception return for a TD, as she danced round the entire Titans offence on her way to an incredible score. Unfortunately, a late injury to Kerry McLaughlin, as she snagged another interception, means that the Pirates will need to soldier on without her for the rest of the year. The final score was 67-6. The game-day MVPs were Paige Cawley for offence, and Kerry McLaughlin, who had an interception in every contest on the day. Next up, the Pirates will head home for their first ever hosting duties. They take on the Titans, Chorley Buccaneers and Sheffield Giants – all three sides have playoff aspirations, as the Giants in particular will be looking to avenge their loss and seize #1 seed from the Pirates. The tournament is at Ravenscraig Regional Sports Complex on the indoor pitch, starting at 1.45pm. Fine more info in our Facebook tournament invite.